Driving education schools in Texas have to be licensed, so that they can offer driving lessons to the general public. In this way, state authorities ensure that schools are able to offer the highest quality teaching to future drivers. 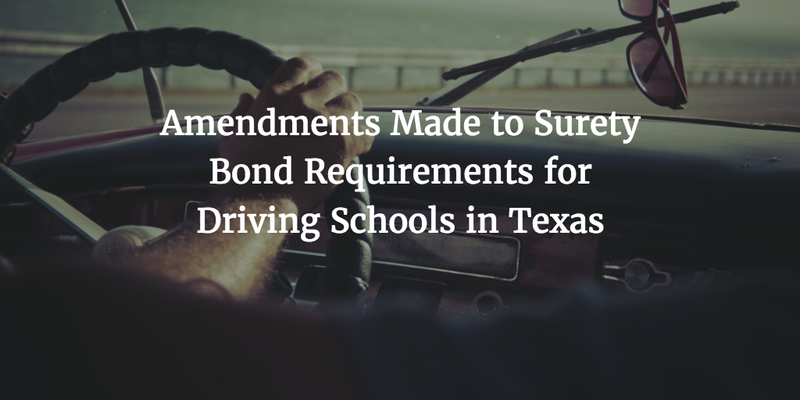 One of the licensing requirements is to obtain a Texas driver education school bond. The purpose of this surety bond is to guarantee that schools will abide by all applicable laws. In this way, the bond provides further security for prospective drivers. The Texas Department of Licensing and Regulation recently adopted new regulations regarding the bonding requirements for driver education schools in the state. The changes were made in the Texas Driver Education and Safety Law. Here’s what you need to know about them. All driver education schools in Texas need to obtain a license from the state Department of Licensing and Regulation. You have to complete the full application form and provide all necessary information and paperwork. One of the new criteria that you have to meet is to obtain a $10,000 driver school bond for your primary location. If you have additional locations, you have to get a $5,000 for each additional branch. State authorities also allow schools to provide alternative forms of security in the same amounts if necessary. The goal of the Texas driver education school bond is to ensure that schools will comply with the Texas Driver Education and Safety Law. In case a school transgresses from its obligations to students and state authorities, it can face a bond claim. Proven claims can provide compensation to affected parties. As with other surety bonds, you have to apply with a surety to get bonded. It has to examine your personal and business finances to assess how risky is your application. That’s how it can determine your surety bond cost. Your surety needs to take a close look at your personal credit score, assets and liquidity, and business finances. If they are in good shape, you can expect a lower bond rate. The typical bond premiums for applicants with solid finances are in the range of 1%-5%. This means that your bond price can be between $100 and $500 in case you have to get a $10,000 bond for one location. If you would like to decrease your bond premium, you can work on improving your finances, such as paying outstanding debts and improving your credit score. Driver education schools in Texas have to keep their bond active at all times during their licensing. When you renew your license, you also need to make sure your bond remains in force during the new period. According to the new rules accepted by the Department of Licensing and Regulation, you can present a continuation agreement instead of a new bond or other security. This means that you can undergo the license renewal process with less hassle. You need to use the official continuation bond forms for a primary location and/or for a branch school. Start your Texas driver education school bond application today! Why us? If you have more questions about the new surety bond requirements for Texas driver education schools, you can reach us at 866.450.3412. Our bonding experts will be happy to help you. Third Party CDL Testers: Ready for the New Illinois Surety Bond Requirements?